Grant Recipient: Glynwood Center, Inc. This project, Increasing Soil Health and Climate Resilience Education for Pasture-Based Livestock Farmers, informed and equipped regional farmers to adopt effective, but underutilized soil health measures. Glynwood worked in partnership with regional livestock farmers, specialists at Cornell Cooperative Extension, NRCS and researchers at UMass Amherst. Glynwood developed a demonstration of pasture improvement methods, the results of which informed educational opportunities offered to regional livestock farmers. These included: a Soil Health Field Day, presentations at regional conferences and online dissemination of our findings via video, blogs and articles. A second demonstration showcased the use of warm season annual forage. Additionally, data collected highlighted the cost effectiveness of planting warm season annual forage vs. buying in hay in dry seasons when perennial forage is not available. The pasture improvement demonstration features sixteen 40’ by 40’ plots dedicated to a variety of pasture treatments: a control plot, managed grazing by sheep and cattle, application of compost, application of fertilizer (high Ca limestone) and keyline plowing to mitigate surface and subsurface soil compaction, and all possible combinations thereof. Glynwood maintains that the keyline plow is the most important treatment to improve soil health in comparable field conditions. The effectiveness of individual treatment on forage quality were in the following order: keyline, grazing, fertilizer and compost. The warm season annual forage demonstration features four acres of tillable acreage sown in a mix of Brown Midrib Sorghum, Pearl Millet and Crimson Clover for the purpose of comparing productivity and expense against the cost to purchase comparable feed value in round bales. We found that producing warm season annual forage is more cost-effective than buying in hay when pasture productivity is poor, reflected by a cost of $763 for forage production against $1100 for comparable tonage in round bales. We do not recommend plowing up pasture in order to seed annual forage. The critical importance of soil health to mitigate climate-vulnerabilities in pasture-based livestock systems has become more widely understood and accepted in recent years. Unfortunately, livestock farmers in NY’s Hudson Valley lack sufficient opportunities to learn about practices and methods that increase resilience to climate-related stressors. The goal of this project was to increase the rate of adoption of underutilized, but beneficial, practices among regional livestock farmers by providing practical and tangible opportunities for them to learn about these practices. 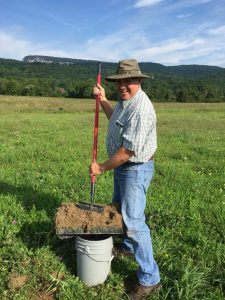 Project lead, Glynwood, partnered with livestock farmers, specialists at Cornell Cooperative Extension, NRCS and researchers at UMass Amherst to conduct two on-site demonstrations and a Soil Health Field Day. Instruction and results were shared through presentations at regional conferences, with additional outreach via online methods (blog posts, external articles and a video). These activities represented a meaningful increase in the number of available opportunities for regional farmers to improve their soil health and adaptive management knowledge and skills. Our overarching goal was to increase the rate of adoption of underutilized soil health measures and adaptive grazing practices among regional livestock farmers. 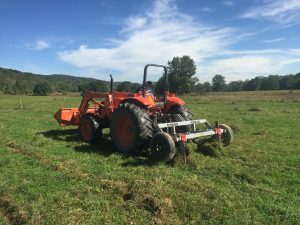 To accomplish this goal, Glynwood used the land it managed for the Hudson Valley Farm Business Incubator as a demonstration of pasture improvement methods in partnership with regional livestock farmers. The demonstrations informed the educational opportunities we offered to regional livestock farmers, including: a Soil Health Field Day, presentations at regional conferences and online dissemination of our findings via video, blogs and articles. Educational opportunities in January 2018 focused on easily implementable and cost-effective ways that livestock farmers can replicate the benefits of our demonstration on their farms. Climate-related hazards, including extreme precipitation and warmer temperatures, pose threats to agricultural production across the board, including grazing lands for animal agriculture — an important sector of the agricultural landscape in the Northeast. While grazing and pasture lands have been called a building block of climate smart agriculture by Secretary Vilsack, farmers in the Northeast need help translating the growing body of research on soil health and its implications for adaptive grazing management into their on-the-ground management practices. Pastures and hayfields in the Hudson Valley are typically located on less than prime agricultural fields, such as, sloped, poorly draining land. Management practices for hay production are typically oriented towards volume production. As a result, farmers cut fields at less than ideal times relative to soil conditions. Repetition of these practices leads to surface and subsurface soil compaction. Soil compaction negatively impacts water infiltration, aeration, biological activity and nutrient exchange, which limits nutrient uptake and pasture regrowth. The management of hayfields is often a net nutrient-extractive process, with little or no animal manures or fertilizers returning to the property. These practices limit biological activity in the soil, which limits productive capacity. Through Glynwood’s farmer training work, it has become clear that regional farmers lack applied opportunities to learn about soil health, mitigating soil health constraints, and adaptive grazing management. This observation is supported by surveys and interviews with program participants and by needs identified by the beginning livestock farmers participating in Glynwood’s Hudson Valley Farm Business Incubator (HVFBI) program. Addressing this training gap will help mitigate climate vulnerability and improve the sustainability of our region’s livestock farmers by giving farmers the practical tools they need to apply principles of soil health to their management decisions. This will, in turn, result in improvements in water quality and the protection of natural resources. Furthermore, if our regional farmers are better able to translate and adopt these underutilized practices, they stand to benefit from improved productivity, a reduction in costs, and potentially an increase in net farm income. This demonstration project was designed to answer the question: which pasture treatment, or combination of treatments does the most to improve soil health, pasture regrowth, soil compaction, and forage quality and species diversity? The pasture improvement demonstration features sixteen 40’ by 40’ plots dedicated to a variety of pasture treatments. The treatments include a control plot, managed grazing by sheep and cattle, application of compost, application of fertilizer (high Ca limestone) and keyline plowing to mitigate surface and subsurface soil compaction, and all possible combinations thereof (see attached diagram). The demonstration areas allocated for rotational grazing were grazed on July 6 – July 7 by eleven head of cattle. The grass height at the beginning of paddock residency was 18”. Cattle were rotated out of the treatment areas when residuals were between 6-9”. The cattle, as planned for, had trampled most of the unpalatable plant species in the paddocks. After allowing ample pasture rest and recovery, the demonstration areas were grazed again, this time by nine sheep owned by Grass + Grit Farm, from August 29 – September 4. The flock was removed from the paddocks when the forage residuals were between 6-9” and the sheep had trampled most of the unpalatable plant species in the paddocks. The length of grazing periods were determined by an estimate of available biomass and pasture rest/recovery period. Non-grazed plots were mowed (clip and leave) before the plants ‘headed out’ in mid-season. — Twenty-four cubic yards of finished compost was applied to the appropriate treatment plots on April 18th, 2017. –Fertilizer was applied in 2016, so it was determined that we would not apply more limestone in 2017. –Keyline plowing was completed by Glynwood staff on September 22nd, 2017, after the final grazing. Glynwood staff and partnering farmers took soil samples in the fall from each treatment plot. Samples were sent to Cornell University for a Soil Health Assessment, including soil penetrometer readings taken by Glynwood staff and partners to gauge soil compaction. Soil samples were also sent to Agro One for soil chemistry analysis. Plant samples were taken in late summer and sent for a forage analysis by Dairy One Labs. Additionally, Glynwood staff and partners conducted three plant forage species counts over the course of the grazing season. This was done by recording observations in a 2’ x 2’ plot in each treatment area. Worm counts, an indicator of soil health, were conducted twice during the season. Glynwood staff and partnering farmers dug 1′ x 1′ sections of soil in each plot, shoveled out at a depth of six inches. A worm count of 3-5 worms is considered good. Farmers in the Hudson Valley region have struggled during the hot mid-summer season with poor performance of native pasture plants. As a result, farmers have had inadequate forage for grazing livestock and many have had to feed out hay in the middle of the summer. According to research conducted in 2010 by Dr. Heather Darby at University of Vermont Extension, warm season annual grasses have the potential to produce six tons of dry matter per acre. The warm season annual forage demonstration will highlight the use and benefits of annual warm season forage as a climate resilience/risk management strategy. Glynwood staff tracked total costs of production and worked with Cornell Cooperative Extension to compare production costs against the cost and availability of locally sourced hay to feed in mid-summer. Glynwood staff prepared the four acre demonstration area in May – June 2017. The fields were seeded in brown midrib sorghum, pearl millet and crimson clover when the soil temperature is 60 degrees (typically early June). A cool and wet spring kept us from completing field preparation and seeding until mid-June. The seeding rates were 35 lbs BMR Sorghum, 6 lbs pearl millet and 5 lbs crimson clover per acre. Glynwood staff and partners evaluated and commented on the labor needs and impact of pasture improvement treatments: compost application, fertilizer application, rotational grazing and use of the keyline plow. Compost Application: Glynwood had access to finished compost for the purpose of the pasture improvement demonstration. Many livestock managers would instead spread manure. Field treatment with compost (or manure) is important when soil health constraints call for an increase in organic matter. Organic matter is not a soil health constraint at the sampling areas in the demonstration. Spreading compost or manure does not require a lot of labor. Best management practices for manure call for regular removal and field-spreading or composting, so this treatment is a cost-effective one for pastures in need of organic matter, increasing biological diversity and improving aggregate stability. Loading and spreading compost can be done inside two hours per acre assuming reasonable distance to and from source materials. Application rate should be determined based on recommendations from a soil chemistry test, to avoid apply excessive nitrogen. Fertilizer Application: Glynwood purchased high-calcium limestone and hired a contractor to spread it. This is a typical and inexpensive pasture improvement treatment. High-calcium limestone was used because the soils were already high in magnesium, which is more plentiful in a dolomite limestone. This is an inexpensive treatment on a per acre basis and an important one to improve low soil pH. Cost varies greatly depending on hauling distance and contractors, but generally will fall in the $30-50 per acre range (hauled and spread). Application rate should be determined based on recommendations from a soil chemistry test. Fall application is recommended. If soil test results call for other nutrients and minor elements, they can be blended with lime and spread together. Rotational Grazing: This is a labor-intensive management practice, but proponents point to multiple benefits in the long-term, like adding organic matter, increasing biological diversity, stimulating root growth and trampling undesirable forage plants. Multiple factors will determine the labor required for rotational grazing, including herd size, paddock size, forage growth rate and recovery rate. The herds used in these demonstrations have required an average of fifteen hours a week for rotational grazing activities such as moving, maintaining and troubleshooting fencing, movement of animals, monitoring grazing impacts and recording related data. Keyline Plow: Setup, use and resetting on this implement takes an average of one hour per acre. A keyline plow requires a high HP tractor and the implement cost is in the $6,000 range. There are few such implements in the region, but they can occasionally be made available to rent or borrow. Data review and analysis was conducted by Glynwood staff, Jason Detzel of Cornell Cooperative Extension and Dr. Masoud Hashemi of University of Massachusetts. Glynwood and partners compared anecdotal findings with the results of the Cornell Soil Health Assessment. Glynwood staff noted that they observed a significant improvement in water infiltration following the use of the keyline plow prior to receiving Soil Health Assessment results. Sixteen samples were sent to the Cornell University lab for Soil Health Assessments. Results from the control sample indicate that Surface Hardness, Subsurface Hardness and Soil pH are the most significant limiting factor to soil function at all sixteen sampling areas. Reducing soil compaction at the surface and subsurface levels will improve water infiltration and open more pathways for plant roots to grow, improving overall soil function. Treatments including the use of the keyline plow to shatter crusted soils showed promise in mitigating soil compaction. The best soil health rating for Surface and Subsurface Hardness occurred with a combination of keyline use and rotational grazing. Soil pH should improve with time, given the previous treatment of the area with limestone and with the improvement of water infiltration. Glynwood staff and partners stress that the Soil Health Assessment results are an inconclusive measurement of the long-term impact of the soil improvement methods. These early assessments provide a baseline from which we can monitor soil health improvements over time. Glynwood submitted samples for soil chemistry analysis to Agro-One for additional baseline data on soil nutrient levels. Soil-Chemistry-for-Pasture-Improvement-Plots Nutrient levels are adequate for good forage production. Changes in soil pH will be monitored via subsequent testing. Glynwood submitted sixteen forage samples to Dairy One for forage analysis. All-Forage-Analyses For reference: Understanding & Significance of Forage Analysis Results. In the field, Glynwood established protocol for hands-on pasture quality and soil health indicators. These simple ecological monitoring practices include forage species and worm counts. Ecological monitoring is a good practice that encourages farmers to slow down and closely observe pasture conditions and the effects of farm management decisions. These two observations require a lot of labor, so it may be impractical for most farmers to replicate this over multiple observations. Adapting the monitoring practices by reducing the number of sample plots or alternating plot observations would make this more feasible for replication. Glynwood and partners conducted three forage species counts during the season. The species counts highlighted a broad mix of plants. The plant community offer a mix of good forage and forbs, as well as a significant population of sedges and other plants of low palatability to livestock. By surveying and documenting pasture plant species before and during treatments, Glynwood has strong baseline data for monitoring changes in the makeup of pasture plant species. Glynwood and partners conducted two worm counts during the season, each indicating a very healthy worm population. During Dr. Masoud Hashemi’s visit at our Soil Health Field Day, he shared that he instructs his students to make a mustard solution to soak the sample area before conducting the worm count. The solution irritates, but does not harm the worm population, and causes the worms to move towards the surface, easing the worm count process. This is a procedural change we would recommend to speed the process. The mustard solution is prepared using a third of a cup of mustard powder to one gallon of water. This amount of solution is sufficient to draw earthworms to the surface at a square foot sampling area. The gallon of solution should be poured out in 2-3 pourings at two minute intervals to encourage the most earthworms to the surface. It is recommended that the worms be rinsed with water when the count is complete. Glynwood has established demonstration plots and protocol for monitoring long-term change over time. Pasture improvement strategies are long-term, thus the effectiveness of various methods will be understood best after multiple years. Support from SARE has allowed Glynwood to establish and test demonstrations and monitoring protocol which will have the potential to benefit livestock farmers for a long time. The warm season annual forage demonstration was designed to answer the question: what is the cost effectiveness of planting warm season annual forage vs. buying in hay in dry seasons when perennial forage is not available? This demonstration has allowed Glynwood to showcase and monitor the effective use of brown midrib sorghum, pearl millet and crimson clover for cattle forage during the warm season. It was a challenging season for the establishment of these species, as field conditions were wet and cool further into June than anticipated. The brown midrib sorghum grew well, while the other species did not. Overall, the warm season annual forage mix yielded an estimated 22 tons of forage over the two grazing periods, averaging a yield of 3.5 tons per acre. The four acres seeded in the forage mix were broken up into one acre plots. Two of these plots performed well. Another performed well, but Glynwood was unable to graze it a second time due to an early light frost. Glynwood did not graze the plot a second time due to concerns for plant toxicity to the cattle. One plot, more poorly drained than the other areas, performed quite poorly. The sorghum never reached its potential height, and it was not grazed a second time due to poor plant regrowth. Glynwood and partners produced 22 tons of forage (on four acres), which we believe to be an average yield with the soil conditions on this farm. Seasonal variability is to be expected, so these outcomes would not sway us from recommending this blend of forage species to another producer. The forage was grazed twice by cattle between July and September. The intervals between grazings were determined based on pasture regrowth, and grazed until forage residuals were reduced to six inches. The length of grazing periods were determined by an estimate of available biomass and pasture rest/recovery period. Glynwood staff monitored and recorded data related to forage output and regrowth through use of an NRCS pasture stick. The quantitative measurement of dry matter of warm season forage was calculated by Glynwood staff. Glynwood staff coordinated with partners in 2018 to review data, soil test results and forage sample analyses. It is recommended that careful consideration to field conditions be given before acting on any pasture improvement treatments. The sensitivity of the land is important. Poor timing of treatments could have negative impacts on soil health, so use of heavy equipment or movement of herds should be avoided during wet field conditions. While some indicators that improvements have already begun do exist, Glynwood staff and partners emphasize that any of these treatments, and combinations thereof, take two years or more to really work. Glynwood maintains that the keyline plow is the most important treatment to improve soil health in comparable field conditions. Compost, fertilizer and rotational grazing will not do much to improve poor Surface and Subsurface Hardness. Use of the keyline plow will shatter soil crust and improve these constraints. Mitigating soil compaction should improve water infiltration, root penetration and growth, which will lead to more productive pasture with improved forage quality. We found that water infiltration and forage quality improved after one treatment. Dr. Masoud Hashemi noted that all of the pasture improvement treatments individually improved forage quality as reflected in Relative Feed Value (RFV) and net energy. The effectiveness of individual treatment on forage quality were in the following order: keyline, grazing, fertilizer and compost. The results of this study emphasized the importance of reducing the soil compaction. The positive influence of using the keyline plow was boosted when it was coupled with a fertility treatment, either fertilizer or compost. The results indicate that grazing is an important management practice to maintain forage quality. A three-way interaction of keyline, grazing and fertilizer seems the most effective and economical practice. The RFV of 120 and the highest net energy in this trio of treatments is high enough for high producing livestock. Economic consideration is needed before adopting any of the individual or combination of treatments. Low producing animals may not need the highest quality forage. Use of the keyline plow is a labor-intensive process at one hour per acre. It is the most labor-intensive of the treatments in the demonstration, but early indications are that this will do the most to improve overall soil health, pasture regrowth, soil compaction and forage quality. A keyline plow is an expensive implement, but a very effective tool for pasture improvement in compacted field conditions. Producers could share or rent the implement to offset the expense. Farmers must weigh individual economic factors when investing in pasture improvements. None of the treatments are cost-prohibitive, but the size of the farm, budget and available labor will help a farmer prioritize and schedule an appropriate amount of soil improvement work. This demonstration iwas designed to answer the question: what is the cost effectiveness of planting warm season annual forage vs. buying in hay in dry seasons when perennial forage is not available? Warm season annual forage can provide high quality forage when native forage is not producing well, or when the cost or quality of purchased hay is less than ideal. We do not recommend plowing up pasture in order to seed annual forage. Farms with crop production can utilize warm season annuals as a part of their crop rotation. Livestock operations without this might look for farming neighbors that might lease acreage or allow for land access in exchange for the organic matter gained in the process of grazing animals on the forage. Planting warm season annual forage required eleven hours in total field preparation and seeding time. Seed costs were $543. The total yield was 22 tons. The average cost of round bales (undelivered) is $50. If this needed to be replaced by hay, it would cost approximately $1100 for 22 round bales based on local pricing. Note that hay availability, pricing and quality are uncertain when there is a sudden spike in demand mid-summer. We found that producing warm season annual forage is more cost-effective than buying in hay when pasture productivity is poor. It should be noted that bale grazing is an excellent strategy for building organic matter when that is a soil health constraint, so if organic matter is low, this may be worth the expense. The development of the two on-farm demonstrations described in this report are a significant part of the SARE-supported work. Glynwood has succeeded in developing a demonstration area to monitor pasture improvement treatments and four acres of warm season annual forage. Glynwood has written several newsletter articles on its SARE Partnership Grant. Glynwood has more than 5,500 subscribers to its mailing list. The first article can be read at: https://www.glynwood.org/connect/news.html/article/2017/07/06/sare-newsletter-bit. Glynwood staff and Pat Knapp, a partnering farmer from Back Paddock Farm, taught Rotational Grazing and Soil Health at the NOFA Summer Conference. The workshop was well-attended and received by twenty participants. During the Field Day, the videographer also captured this interview Dr. Masoud Hashemi in which he discusses principles of soil health. Twenty-five regional farmers joined us for the Field Day, which included Soil Health 101 by Dr. Paul Salon, Water Infiltration demonstrations by Fay Benson, and tours of the field demonstrations interpreted by Glynwood staff, Jason Detzel and Dr. Masoud Hashemi. Glynwood staff and partners presented at two conferences in January 2018: Dave Llewellyn presented at the Northeast Pasture Consortium in Albany, NY on January 25th, and at the Livestock Institute of Southern New England Conference in Bristol, MA on January 28th with Pat Knapp and Shannon O’Sullivan. The Northeast Pasture Consortium was attended by approximately 50 agricultural services providers and farmers. The presentation was well received. The presentation at the Livestock Institute of Southern New England Conference was attended by 25 participants and received enthusiastic feedback. Glynwood has received positive feedback from cooperators and participants in the form of written workshop evaluations and direct feedback from participants. Follow up surveys and reminders were sent to participants later this summer and anticipated an increase in the number of farmers reporting gained knowledge. Responses to follow up surveys were uncharacteristically low. In the future, design and delivery of evaluation forms will be improved in order to maximize immediate responses. Partnerships continue with regional livestock farmers, specialists at Cornell Cooperative Extension, NRCS and researchers at UMass Amherst. Glynwood staff and partners are very pleased with the project outcomes: Two successful on-farm demonstrations, new baseline data for monitoring changes, a successful Soil Health Field Day and presentations at multiple conferences. Glynwood plans to adapt and continue practices and methods used in the demonstrations. 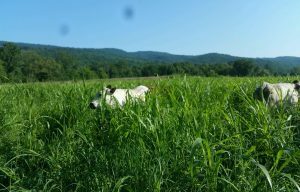 The production of warm season annual forage has been incorporated into a integrated management practice at Glynwood’s home farm in Cold Spring. This season, and in subsequent years, Glynwood will rest one acre used for vegetable production and sow it in summer annuals for cattle to graze. This will provide a fertility boost for vegetables and quality summer forage for cattle. In-field (DIY) soil health monitoring practices were a hit with farmer cooperators, so Glynwood will add additional in-field monitoring practices (water infiltration monitoring, for example) to use as educational modules with apprentices, farm business incubator participants and other regional farmers-in-training. The Soil Health Field Days have been popular. Glynwood intends to continue the collaboration and host more in the future. One of our collaborators has a pending grant application to support this work. The educational opportunities furthered by this grant has strengthened the bond among the collaborating educators. An additional outcome of this grant is the development of committed partners for future collaboration in soil health education. Glynwood is grateful to everyone at SARE for their support!